Oh, I know it is bad form to begin a blog with a cliché, but this is an oldie and a goodie — emphasis on the good. “Charity begins at home.” There, I said it and I typed it, and I truly believe it. All acts of altruism, whether they are publicly announced or covertly performed, have their roots in how you live and how you conduct yourself on a daily basis. That’s why it really warms my heart when I see the doll community coming to the foreground and doing an act of random kindness or deliberate concern. Case in point: the mystery box of Muslim dolls that suddenly appeared without fanfare on the porch of a Canadian woman’s house. After returning home from work, Sheza Hasan was surprised to discover a large box waiting for her. She hadn’t ordered any Amazon merchandise, and knew it wasn’t her birthday. So, what could it be and who could have sent it? 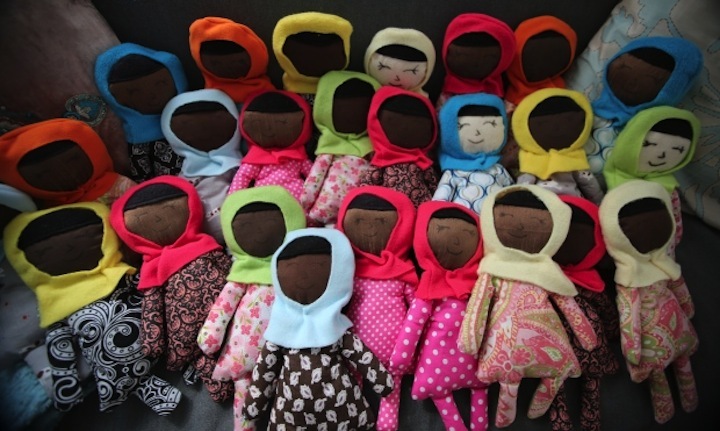 The first question was easily solved: inside were 25 handmade dolls clad in a rainbow’s worth of colorful hijabs. 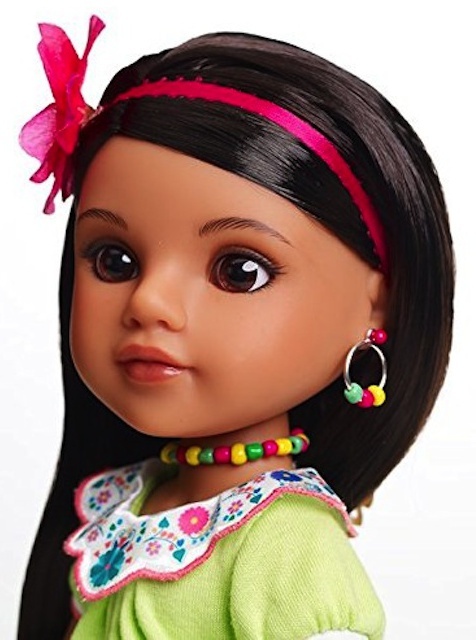 The dolls were of different facial complexions and were garbed in a variety of stylish outfits. 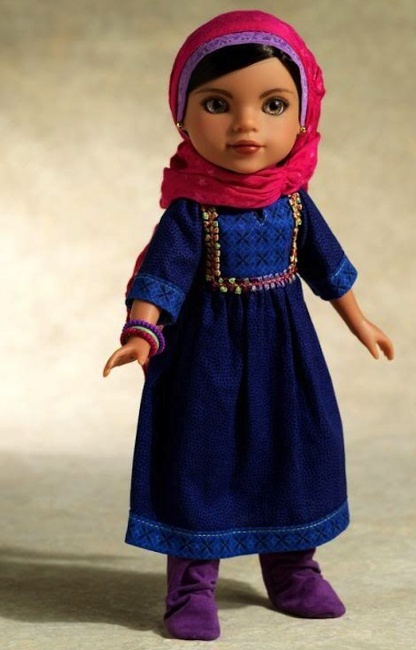 The dolls’ hijabs could be removed from their heads, letting their hair become visible. What’s incredible about this message is that no name is provided — the gift-giver is truly unknown. But even though we don’t know who did it, we know some things about the person. He or she — the gender isn’t included — is not a Muslim. This is a person who does not practice this faith, and is not part of this culture. However, this concerned individual wants to improve the lives of young Muslim girls. 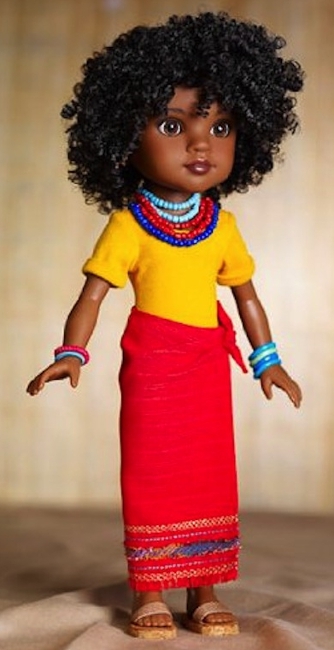 Shula, the Afghan doll, from the Hearts for Hearts debut line. This tale from our neighbors to the north opens up a whole world of doll possibilities. 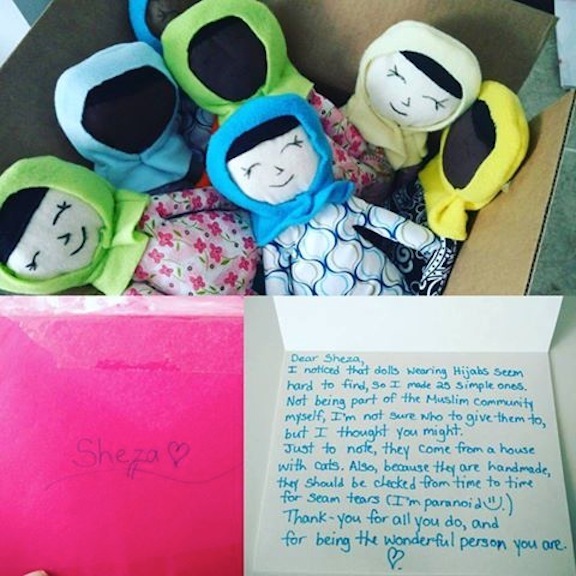 Sheza Hasan now holds in her hands the ideal chance to “pay it forward.” Rather than keeping all 25 dolls for herself — hey, they were left on her front steps — she will retain one for herself and will seek out two dozen girls to gift the dolls to. She will make sure the pretty playthings find good, loving homes. And that is the purpose of a doll: to help make a home better and more loving. We have all been inundated with awful stories of hurricanes, floods, earthquakes, and natural destruction and devastation. 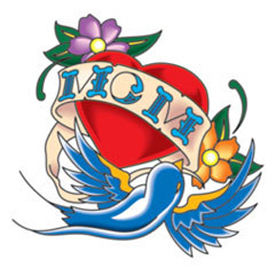 The news of the past month has been a tsunami wave of tragedies and despair. But now the rebuilding of cities in Florida, in Georgia, in Texas, in Mexico, and in Puerto Rico will begin. 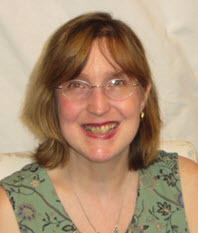 In addition to financial donations — given to reputable charities — what else can we do? We can take a page from the covert Canadian do-gooder. We, too, can send dolls to the children who have been displaced. While houses and homes have been flattened and razed, that means children’s toys have also been eradicated and sunk. New toys will have to be found and bought. 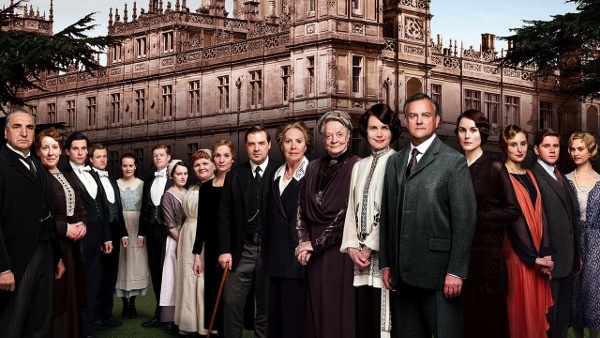 During times of crisis, the notion of a plaything is placed on the backburner. It is not an essential necessity; it is not a need but rather a desire. Or is it? Children are not homeowners. They don’t have cars. They don’t own boats. They don’t have property to lose. The only things that they can claim for their own are their toys. It would be quite wonderful if all the doll artists, manufacturers, collectors, and enthusiasts contacted local municipalities in the affected areas. It would be remarkable if Barbie dolls, fashion dolls, baby dolls, American Girls, action figures, and all other well-known dolls (as well as lesser recognized counterparts) could be sent to the children of the storms. 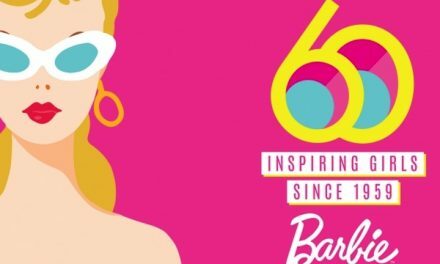 A panorama of Mattel dolls that embody today’s America. I saw the images of the scared stray animals and the trembling pets that were left behind as the water rose in Texas. The images of cats and dogs — and in one photo, a caged hermit crab — having to be rescued by boat brigades was a powerful one. I immediately donated to an animal rescue group situated in Austin, Texas, which was partnering with the humane associations in the devastated regions. I am now going to look into Toys for Tots and see if they have a special hurricane relief outreach. (I know they did one post–Hurricanes Katrina and Sandy.) Their annual drive for Christmas collecting kicks off in October, and we are but a week away from that date. I shall be going all out with doll donations. I’ve done it before, and I shall do it again. The Hearts for Hearts line was created to raise revenue for girls around the world through WorldVision. Realizing how fearful all these children must have been when their familiar worlds have been washed away, I recognize that this sharing of dolls is a small step, but an essential one. 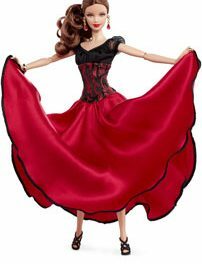 A doll will help to restore stability, provide an imaginary companion to cuddle and confide to, give a sign that people care and want to help. Charity does indeed begin at home, and having a doll to love is certainly a symbol of a caring and cared-for home. Please give! Let’s Get Ready to Rumba: NFL or DWTS? Both are physical, ferocious, and fan favorites.